The marauding Blight has scattered, but a new, more sinister evil rises in its wake, and once again the Grey Wardens rise to face a deadly foe in the Dragon Age: Origins - Awakening expansion pack. Forget your humble or not-so-humble origin. Whether pauper or prince, imported character or newly generated for the expansion, this time you're in charge of the Gray Wardens. You're just in time to face off against a new, strangely intelligent, highly vocal sort of Darkspawn, embarking on a quest that could very well unravel the mystery of the recurring Blight once and for all. Rather than downloadable content, Awakening is a full expansion pack, so you know you can expect a level-cap increase, interesting places to go, people to see, and monsters to kill. What you might not know, is whether you should spend $40 on fifteen to twenty hours of expanded gameplay. Well, should you? The Continuing Saga: There's nothing quite like the feeling of completing a lengthy role-playing game, maxing out your characters, and then getting the chance to revisit them, adding an additional layer of depth and power to your creations. Just as I consider Dragon Age: Origins to be the spiritual successor to BioWare's Baldur's Gate, Awakening can be likened, to a point at least, to the Tales of the Sword Coast expansion for Baldur's Gate. The level cap is increased, you visit new lands, you find more powerful equipment, and in the end you (possibly) save the day, again. But Awakening actually goes a step beyond that. With new specializations and talents, it feels more like an MMORPG expansion than something you see in a single-player game. Rather than simply making you a more powerful version of what you were before, the additional customization options actively work towards defining your character's role in your party. I wanted to be a sneaky rogue in Dragon Age, but always felt like I was simply a weak fighter in leather armor. With the new Shadow specialization, I am the sneaky rogue I wanted to be. Injecting A Little More Character: While Awakening did briefly saddle me with my least favorite character from the original game, it made up for it with a new cast of characters that, at times, seem even deeper and better developed than the first group, despite having so much less screen time. Of all the new additions, Anders, a quick-witted mage on the run from the prison-like Tower of Magi, completely stole the show. Not only is he ready with a quip at every turn, he's also incredibly fond of kittens. Keep an eye out for animals of the feline persuasion as you play through the game - that's all I will say. It's so adorable, you'll want to sleep with him. You can't, but you'll want to. 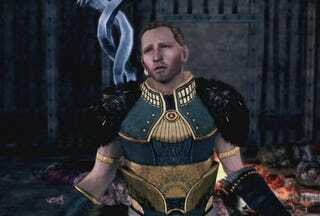 Identity Crisis: By the end of Dragon Age: Origins - Awakening, I was left with an odd, conflicted sort of feeling. Awakening certainly didn't feel like downloadable content; it's too big to fall into that category. It's marketed as an expansion pack, but the amount of work BioWare put into fleshing out the new characters and the new, more intelligent Darkspawn threat goes far beyond what I'd normally expect from a simply expansion pack. It mostly resembles a full-blown sequel, but it stops short, never quite reaching that level. Indeed, it almost seems as if BioWare consciously knew they were putting too much work into Awakening and pulled back at the last minute, leaving me with the gaming equivalent of being on the verge of sneezing but never quite making it there. I suppose my only complaint with Dragon Age: Origins - Awakening, then, is that the development team put effort into the expansion. It seems silly, but the feeling remains. While I enjoyed my time with my new companions, taking on a revived and evolved threat and making decisions with consequences just as world-shaking, if not more so, than in the original game. I just felt that right when I was reaching my stride, the game stopped, as if afraid I might enjoy myself too much. Still, uneasy feeling or no, Dragon Age: Origins - Awakening is twenty more hours of Dragon Age: Origins, and if you felt the same way I did about the original release, feeling slightly unfulfilled isn't going to stop you from milking every second of enjoyment out of the expansion that you can, and there's plenty of milk in those udders. Dragon Age: Origins - Awakening was developed by BioWare and published by EA on March 16 for the Xbox 360, PlayStation 3, and PC. Retails for $39.99 USD. A copy of the game was given to us by the publisher for reviewing purposes. Played through the entire game on PC, then fiddled about with the PlayStation 3 version.